As the Epiphany approaches, this writer is lying on his sofa, ravaged by the effects of flu and existential angst; some cruel types might confuse the last-named with self-indulgence. To highlight the latter mood, Serge Gainsbourg is ordering his listeners to Laissez Moi Tranquille, a song that is bound to cheer all who hear it. It is indeed an afternoon for donning a black roll-neck pullover a la Tony Hancock in The Rebel. The 6th January is “La fête des Rois” or “le Jour des Rois”, celebrating the visit of the Three Wise Men to the infant Christ. In France, the traditional food for this time of year is “Galette des Rois – “King Cake – which is essentially a puff pastry that will contain a small figurine. In the days of ancient Rome, this time of year was marked by feasts where masters and slaves dined together and whoever found a bean (a fève) in his cake was decreed the king of the feast. The ceremony became a part of the Epiphany, and the cake survived the French Revolution, where it was temporarily re-named ‘“Gâteau de l’egalité’. By the 1800s onwards the bean was succeeded by a porcelain model. Today, the galette is most likely to have a plastic toy as “Le fève”, and whoever finds it becomes the king or queen of the day. With such a position comes privileges, such as exemption from domestic chores; many bakers and supermarkets supply a crown along with the pastry. Other charming traditions associated with the King Cake are an extra slice known as part du Bon Dieu, Vierge or Pauvre (Good Lord, Virgin or Poor) for any stranger who might cross your threshold – and that the youngest member of the household must sit under the table and direct the serving. Someone who will have no chance of discovering a fève is Emmanuel Macron as it would not be wholly appropriate for the President of France to be declared king, even on a temporary basis. 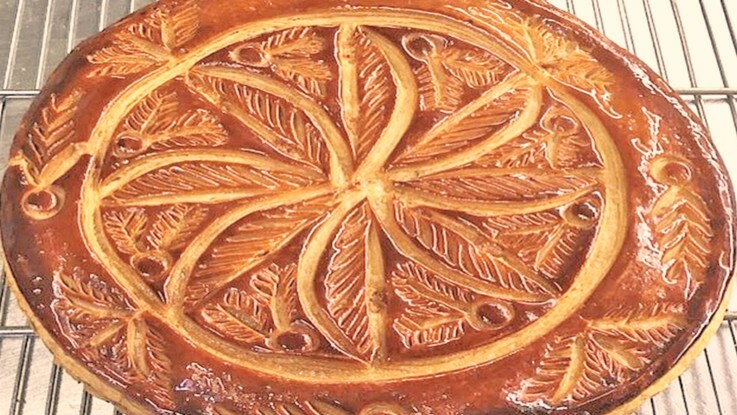 To even describe Galette des Rois has a cheering effect, even upon this flu-suffering Englishman, for it is a joyous celebration. And so, regardless of you being crowned this evening – may we wish you a splendid 2019.